I used to get manicures and pedicures done regularly. Had a favorite salon, favorite nail polish brand and a favorite nail technician. Somewhere along the line I stopped going every other week and started to go once a month. Once a month turned into once a season and now I can’t even remember the last time I had a professional manicure or pedicure. Recently, I do my own nails and that has just been that. Remember though that this is the year of self-care and remembering to #LoveMe. I must admit that loving me is a lot easier when I can combine it with treating JustaBXgirl to something special. And its even better when I can share it with all of you! I know we are HUGE My Little Pony Fans in our house. JustaBXgirl knows all of their names and has plenty of adventures playing with her very own Crystal Empire. 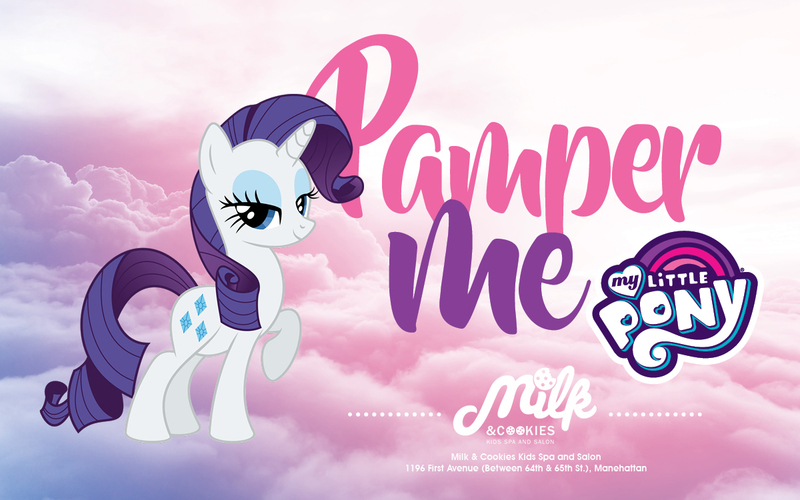 When news of a MLP Pop-Up Spa happening at Milk & Cookies found it’s way into my inbox I definitely did my happy dance. And don’t worry, I’m not bragging because you too can book your own service. The Pop-Up Spa will be happening Feb 9th – 16th and will have many different Pony options available. Here’s a look at what you and your little pony can get! *Milk & Cookies Kids Spa ends all services with a complimentary fresh-baked cookie and milk. **Every child who books a service will receive their own My Little Pony figure to take home. Thank you to Milk & Cookies for inviting us to attend this amazing event as media. JustaBXgirl is going to be so excited to get a mani. She’s only allowed them for special occasions. We are currently booked for The My Little Pony and I’m figuring when we get there JustaBXgirl will talk me into letting her get the Twilight Sparkle as well. Who knows, this mama might treat herself to a Twilight Sparkle too! You can make your appointment today by calling 646-850-4032. Which service do you think your little will love? Events happening when I don’t live in NYC anymore. Think it means you need to visit or move back soon!